Building a prison in computer graphics.. 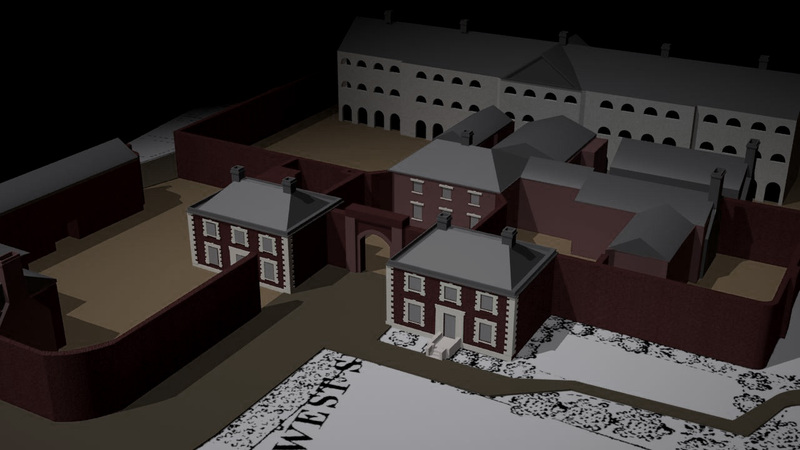 It is early days, but work has started on a computer graphics version of the House of Correction which is to be featured in one of the next Bald Explorer episodes. If you have been reading recent posts you will have seen mention of this grim place and the fact that there is little left to see now. I aim to recreate it, albeit virtually, so that we can see the grim building for what it was and appreciate how dominant it must have looked on the top of its hill bearing down on the inhabitants of Petworth towards the end of the 18th Century. Where possible I always like to gather as much information about the subject I am making in computer graphics. One of the first pieces of luck was noticing that the prison is clearly marked in precise terms on the planning maps for Petworth in 1875. Not only was the building’s shell accurately drawn up, but also the cells and ancillary buildings, such as the treadmill block and handcrank shed. From there I can extrude upwards the walls and produce a skeleton of the old prison. What one does still require are the real measurements of widths of walls, heights of buildings and detail of roofs, etc. Luckily, there was an inspection of prisons made in the 1840’s and it included the Petworth one, giving not just a written description, but accurate measurements and dimensions in feet and inches. What is lacking, however, are drawings or photographs of the House of Correction. That said, I do have an old sketch of the place and one scratchy early photo which gives us the rear detail and roof. I do not intend to make an all singing and dancing model, that would take too long, but fair representation of the austere nature of the place will do. Besides my cg skills are very sparse, so I will do what I can. I am not sure if anyone has done any work in this area before, so it could be a valuable contribution to the knowledge we have on the Georgian/Victorian building, who knows? There are plans to rebuild on the site, so all that is there is likely to be lost for ever, so I must work quickly before all my references are gone.